Acquired from the above by the present owner, April 1968. Roslyn Harbor, New York, Nassau County Museum of Art, Chagall, July-November 2012, p. 38 (illustrated in color, fig. 32). 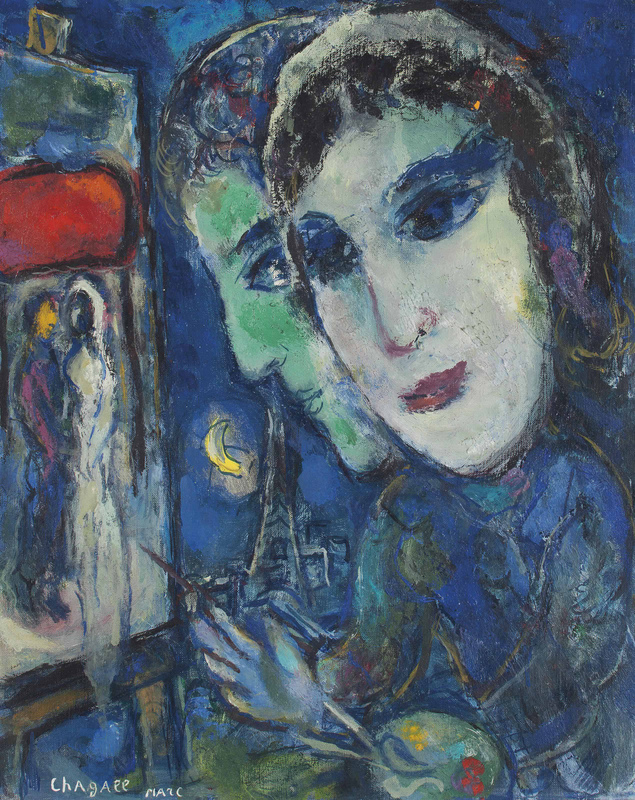 The present work comprises Chagall's favored imagery--the artist at his easel, with his lover at his shoulder; the bride and bridegroom on the canvas at left; and Paris at night, the Eiffel Tower in the central background, suffused in cool blue and green tones. Having lived off and on in the capital since leaving Russia in 1910, he never ceased to admire its beauty: "Paris is a picture already painted" (quoted in F. Meyer, Marc Chagall, Life and Work, New York, 1963, p. 529). Of Chagall's substitution of Paris for his native Vitebsk after World War II as pictorial locus, Franz Meyer has written, "In Chagall's pictures, the 'town' is the reference point for the inner world in the outer reality. That Paris could now play this role alongside Vitebsk... is partly due to the loosening of his real filiation and loyalty by the destruction of his home town during the war. For he did not feel bound to the rebuilt town by the same positive tie. Now it was only the Vitebsk of his memory that really existed for Chagall, and this 'inner' town was sometimes confronted by an 'outer' town, namely Paris" (ibid., p. 529). (fig. 1) The artist looking out from his apartment on the Quai d'Anjou, 1958-1959. (fig. 2) Marc Chagall, Paris par la fenêtre, 1913. The Solomon R. Guggenheim Museum, New York.